New ECU Joondalup midfielder Jayden Drummond can’t wait to get starting in the PS4NPLWA, after moving from Sunday Amateur Premier League side Kingsley FC. 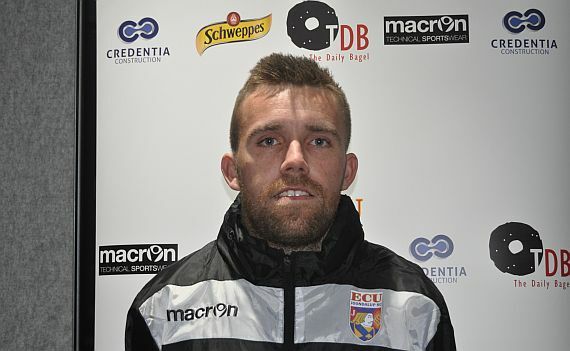 A chat with ECU coach Dale McCulloch in pre-season had Drummond contemplating a move, but decided against it, but McCulloch contacted him again last month and the rest is history. “Dale contacted me about a couple weeks before the start of the season after a good pre-season with Kingsley and getting to the night series final, I came down for a couple of sessions and had a good chat with Dale Toughy and Steven, and the opportunity to join was there,” he explained. Drummond was born in New Zealand and came over to Perth at the age of six, but never played football until he was 10, but once he started he couldn’t stop. He’s played most of his football at Kingsley, from under 11’s to the first team, but had a season at Wanneroo as an 18-year-old. He travelled to Malaysia in 2014 with the WA State Amateur squad, but missed out on last season tour due to work commitments.